We are a family run business, providing you with an exceptional product, and great service. Our great looking colorful tent and extremely popular product has been a hit at many venues, fairs, festivals and craft shows. The novelty of watching the process from start to finish & the smell of freshly popped kettle korn in a visible bag keeps our customers coming back for more. Our kettle korn is the biggest, roundest, crispiest, lightest, tastiest kettle korn around and contains no artificial additives or preservatives, and is cholesterol free. How we make it!! Everyone can watch. We use quality ingredients, gourmet popping corn, canola oil, sugar and popping salt, and that’s it. It is popped in a stainless steel kettle at very high heat to allow for popping perfection, adding the quality ingredients and stirred by hand. Each batch is bagged, sifted and dusted right in front of the customer. 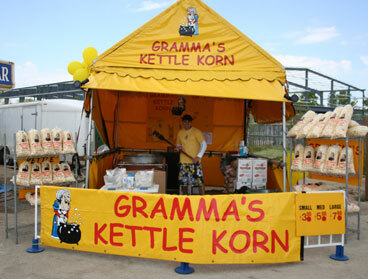 All this to ensure that your kettle korn is the most amazing sweet and salty popcorn you’ve ever tasted. We take pride in the product we serve and how we operate, by meeting all Provincial Health and Fire Regulations required by the City of Winnipeg.